Since 2001 the ashram has been running a charitable junior high school by the name 'Baba Bhuman Shah Vidya Mandir' exclusively for the poor and needy children of the neighbouring villages. 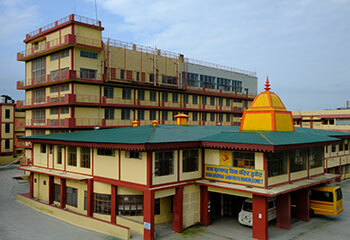 The school is located within the ashram premises. With more than 65,000 square feet of covered area, it has a large infrastructure with 32 spacious classrooms, 8 large halls, and 2 large auditoriums. 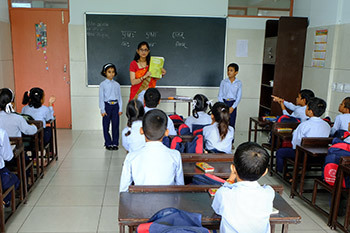 The school is equipped with modern facilities such as a computer and multimedia lab, well-stocked library with over 4500 books, magazines, CDs and DVDs, a big playground, science lab, CCTV cameras, projector, speaker systems, language lab, etc. The school provides high quality education — academic as well as moral/ethical — to over 700 children almost free of cost, along with books, stationary and uniforms. The main objective of the school is to generate in the students high moral and ethical values together with modern day academic education. Each morning before starting their classes the students sit together in prayer and recite scriptural hymns. Along with their regular courses, they have a special period of self-evaluation on practical ethics, character building and inculcating virtues such as self-discipline, compassion, selfless service, simple living, self-confidence, etc. To encourage such values, the students get marks for truthful conduct, for respecting their elders and serving their parents, and for waking up early in the morning and praying to God, etc. The children are taught three different languages: Hindi, English and Sanskrit. They also have classes in classical Indian music and yoga asanas. To further inculcate the values of hard work and responsibility, the children also actively and joyfully participate in the upkeep and cleanliness of the school. The school has been functioning with excellent results in academics, sports and extracurricular activities, and many of the children have achieved high positions in this area, especially in yoga asanas, music and public speaking. The school has more than sixty qualified teachers and staff. The ashram provides highly subsidised and furnished accomodation to the school staff. 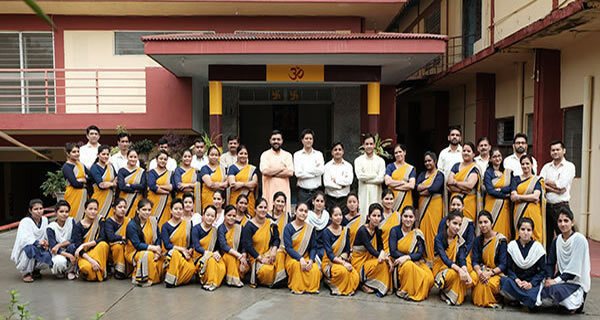 Since 2005 the ashram has been running free one-year vocational training programmes in Sewing and Computer Education, in which the poor ladies and unemployed youth of this area receive free training in these fields. Free sewing machines are given to the trainee ladies upon the successful completion of the sewing course. Since its inception, more than 400 hundred trainees have passed these courses, thus attaining the skills and training necessary to earn a living. "Meditation is not only sitting with closed eyes; it is to be aware of God through all doings and non-doings. By supplementing sadhana with selfless service we heighten the capacity of meditation, and make the contemplative life stronger and sweeter."